No other couple to date has so embraced their color theme like these two. 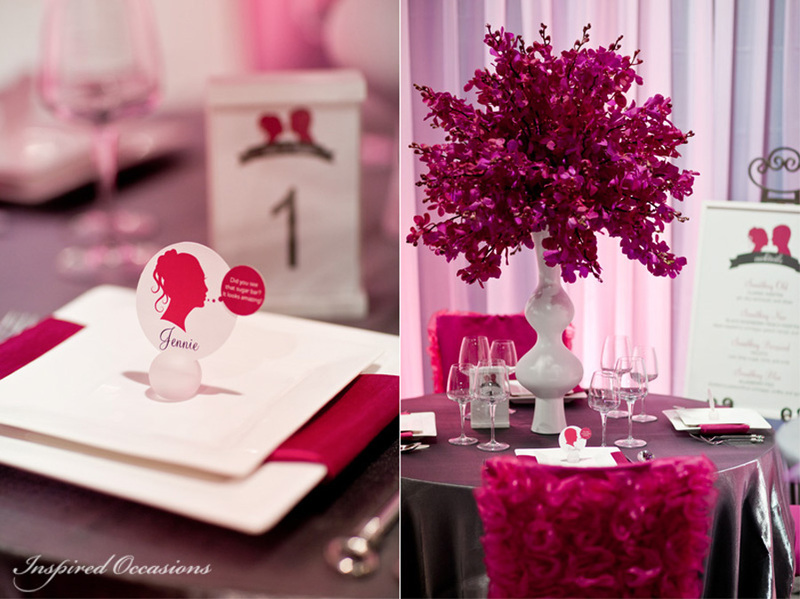 Vibrant fuchsia pink and midnight black created a tremendous impact that perfectly reflected this couple. 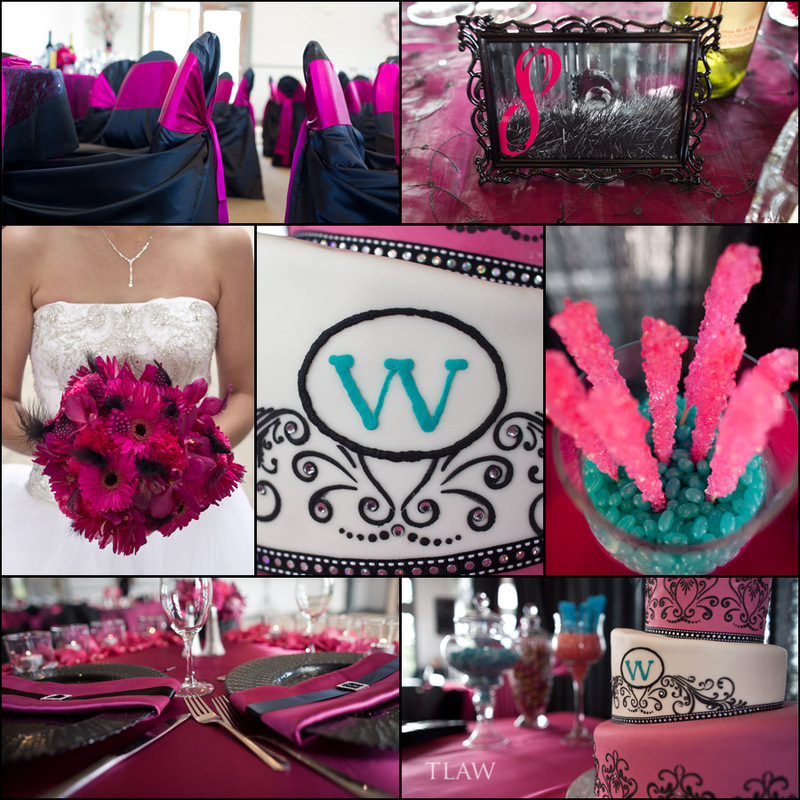 The bouquets and boutonnieres featured pink spotted feathers and black marabou and spider Dahlia’s. 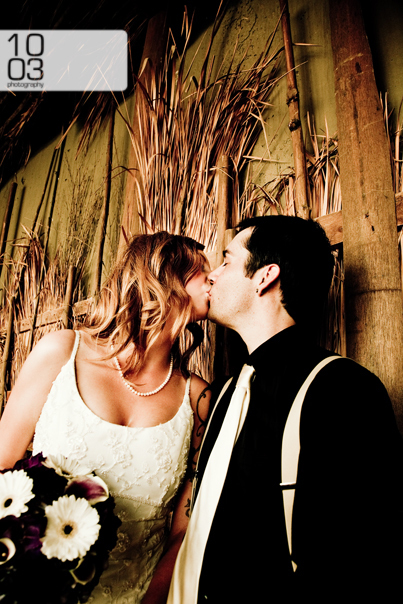 What can you say about a couple who just seem perfect for each other. 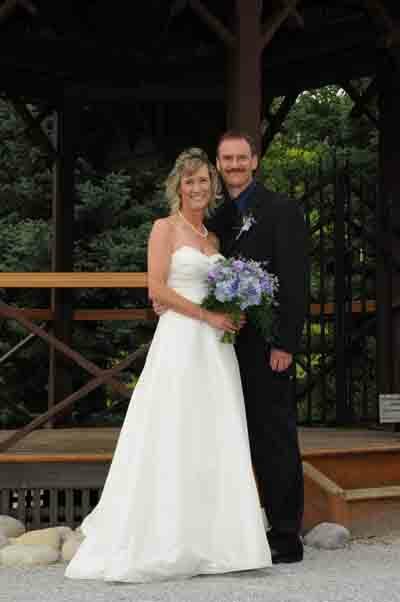 These two nature lovers decided t tie the knot in Canmore in the great outdoors. 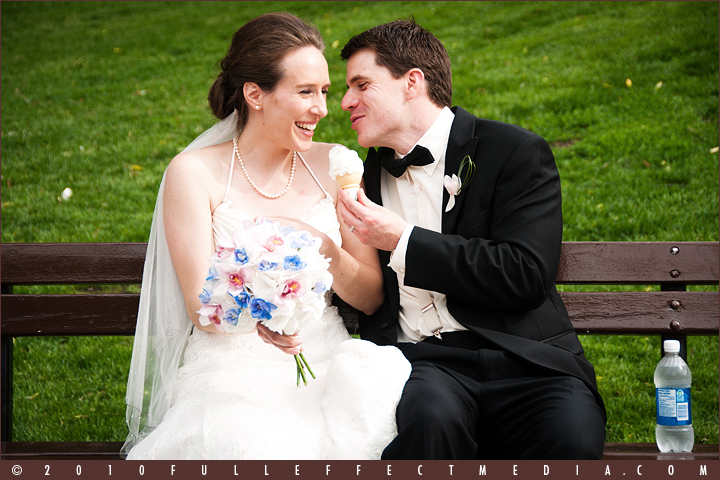 The day was beautiful and warm just like Colleen and Ed. 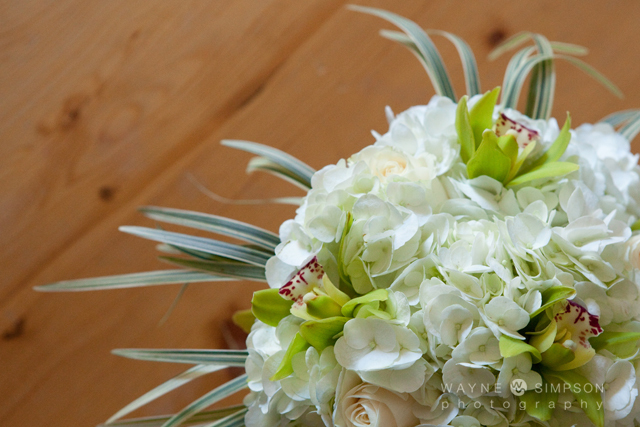 The Hydrangea bouquets showcased mini Cymbidium Orchids and a collar of wispy Monkey Grass. Table centers of planted wheat grass carried through the natural vibe. 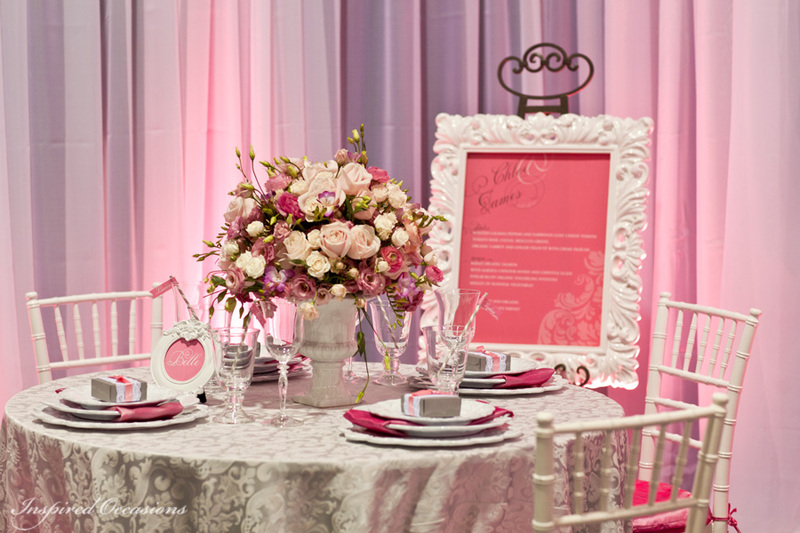 We created some stunning floral arrangements this past weekend for Terra Law of Inspired Occasions Bridal Fair booth. We have worked with Terra for quite a while now and I am still blown away both the creative and unique designs she comes up with. 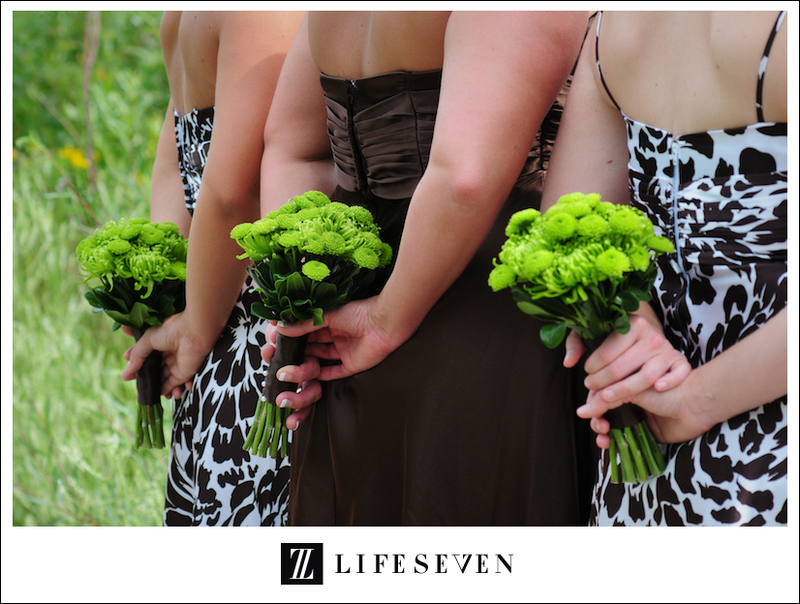 We created two distinct looks for Inspired Occasions – One Modern and the other Southern Belle Inspired. Which one is your favorite? 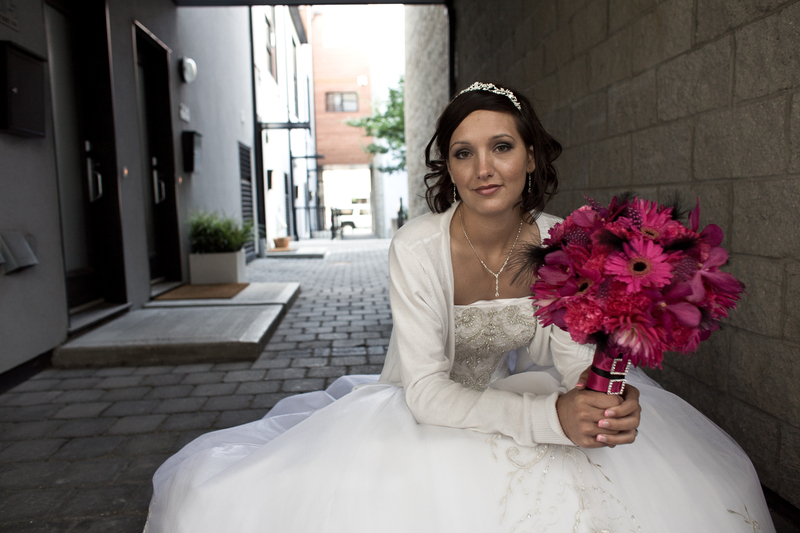 The fabulous photography is by TLaw Photography. We Are Famous – Again!!! 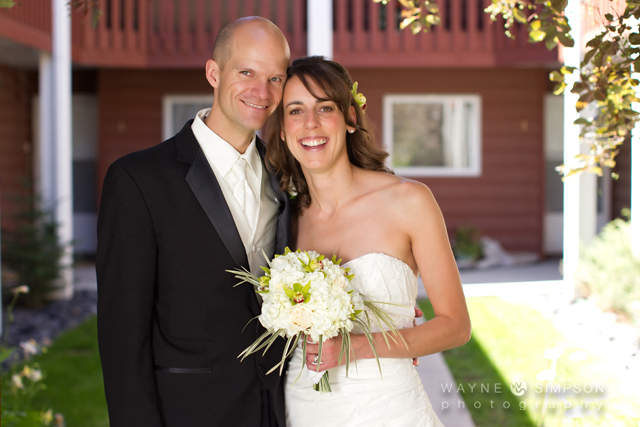 This is a vibrant and passionate couple who didn’t shy away from color. 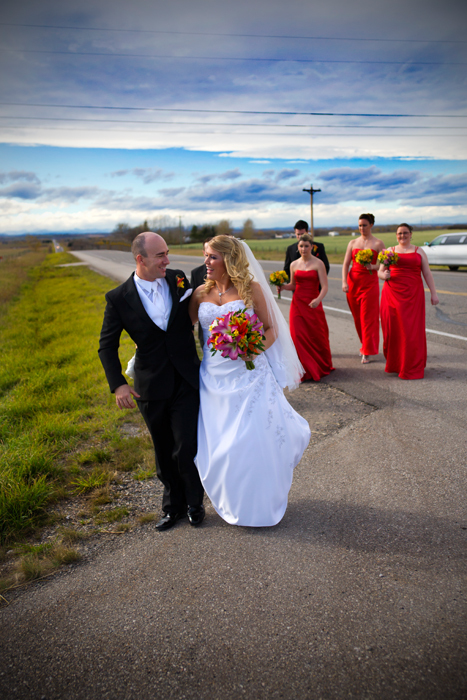 Bright pink, orange and yellow combined together to create stunning bouquets. Dark pink Cobra Lilies, orange Asiatic Lilies and yellow and orange Alstromeria were the perfect flowers to create an elegant yet rustic feel to wedding. 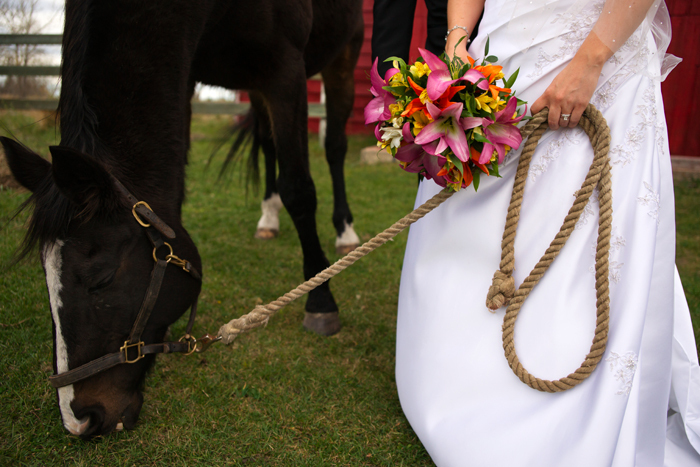 A great fun-loving couple who tied the knot at the Calgary Zoo. We say it if all our couples, but these two are so in love with each other that you can’t help but smile as you look at them. 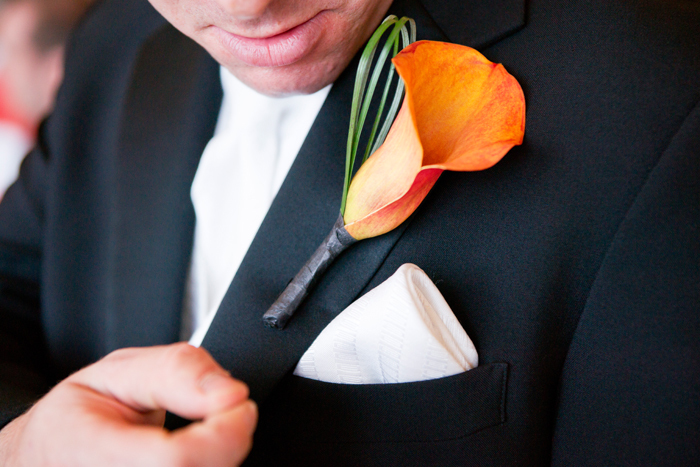 Love the Ringbearer ‘s Ring Apples – great idea from Inspired Occasions. 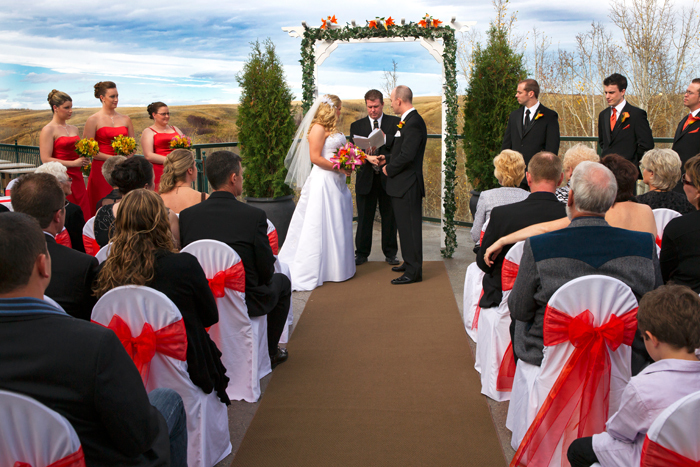 A busy professional couple who said I Do at the Conservatory at the Calgary Zoo. 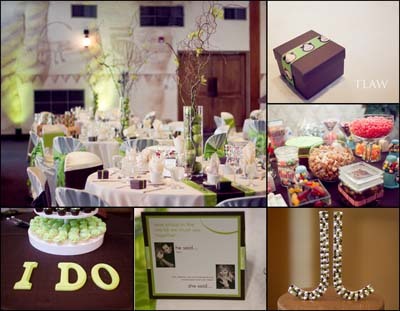 Their easy going spirit made them a joy to work with and their soft color palette complimented them perfectly. 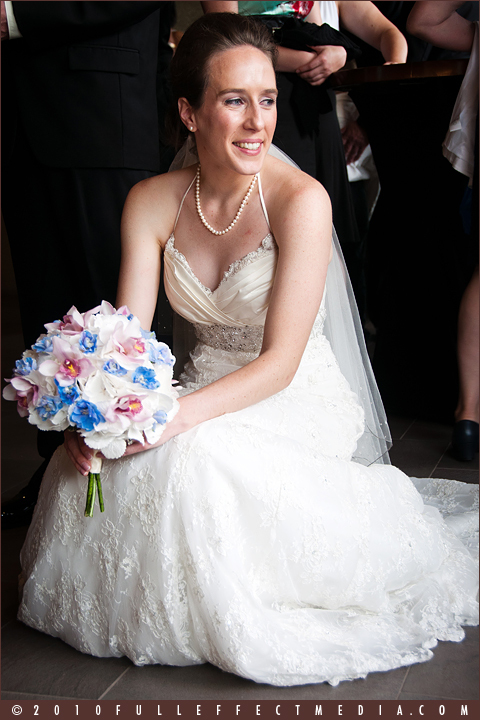 The bouquets featured Hydrangea, Cymbidium orchids and Delphinium. 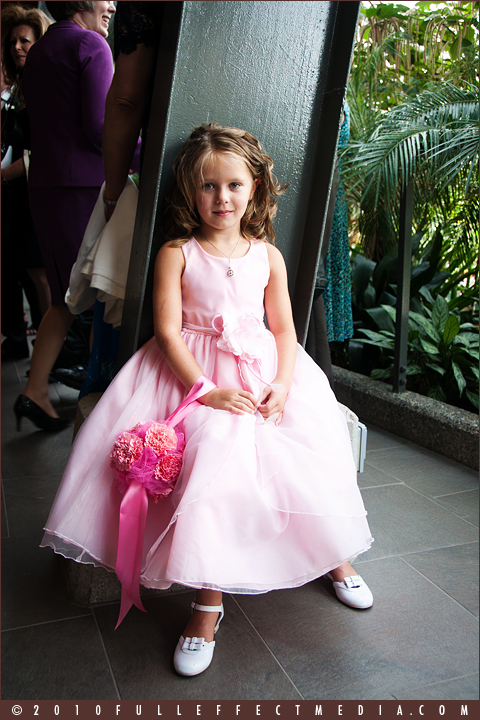 The flower girl carried a pink tuille ball covered with pink carnations. 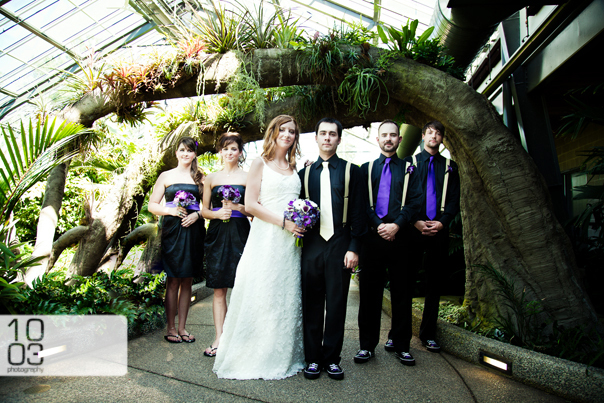 A young fun and funky couple who were wed at the Calgary Zoo. 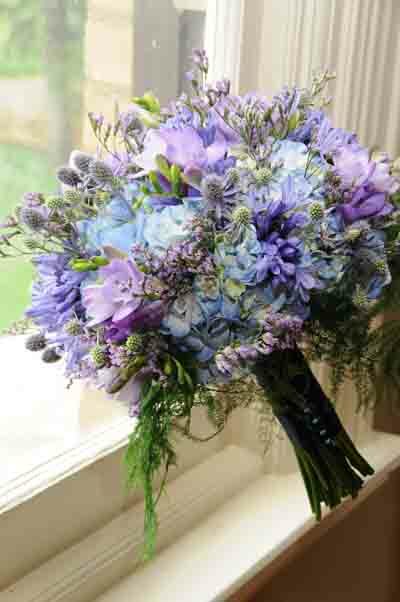 Jessica’s love of purple really shone through from the pretty Bridesmaids dresses to the Groomsmen’s ties to her stunning bouquet. 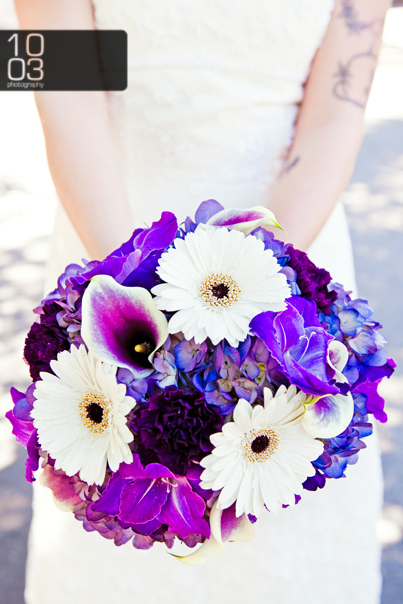 The bouquet featured purple Hydrangea, purple Dahlia’s, purple Gladiola blooms, bright white Gerbera’s and stunning Picassa Calla Lily. White, which technically is the absence of color is a very important part of the color spectrum. 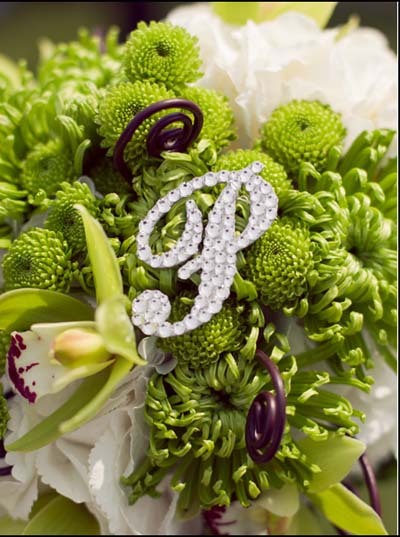 I always feel a bit of white in a flower arrangement is like a dash of salt in food – it just brightens everything up. 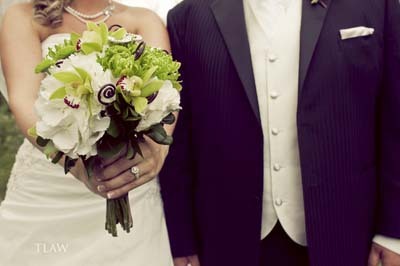 White is THE most popular color for wedding flowers and for good reason. 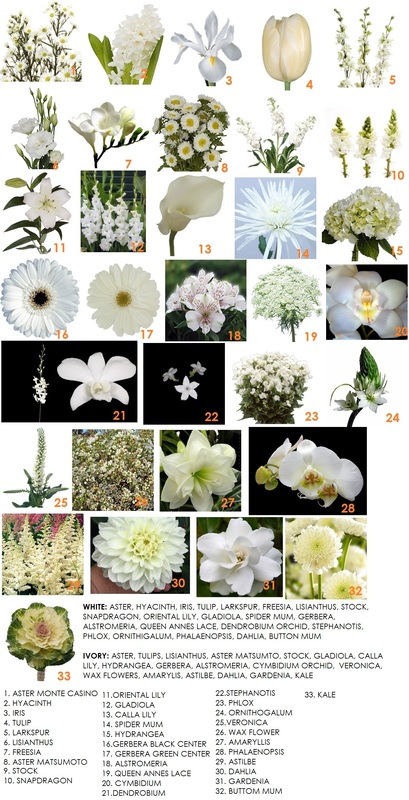 The sheer number of flowers that are available in white is amazing and the fact that is can go with pretty much any other color is the icing on the cake.The choice of flower ranges for the whimsical Daisy to the exotic Orchid with everything in between. Some of the flowers are seasonal, which I feel adds to their allure. In the Spring we have; Tulips, Hyacinth and Iris. Summer brings with it; Larkspur, Queen Annes Lace and Astilbe. While the Fall showcases; Amarylis and Kale. All the remaining flowers are available throughout most of the year.